Local motorists spotting members of the Pahrump Valley Fire and Rescue Services at the intersection of Highways 160 and 372 should keep two things in mind this weekend. The firefighters are performing a service that benefits many area families and they’re risking their personal safety for the cause. 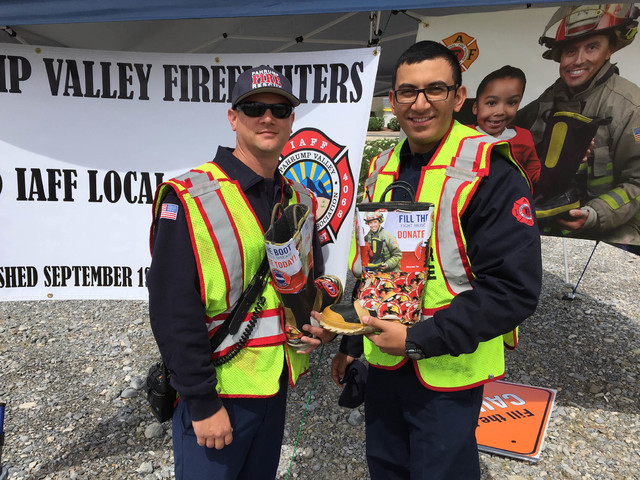 The Muscular Dystrophy Association’s (MDA) annual “Boot Drive” is in full swing as evidenced by the presence of fire crews at the town’s busiest intersection, which began last week. The annual event is the fire department’s major fundraiser for the association, as firefighters, with boots in hand are seeking any kind of monetary donation. Pahrump Firefighter Alan Bigelow said the program gives local kids afflicted with the disease an opportunity to enjoy much needed recreation. Bigelow also said fire crews are pleased to be back on the streets after an absence of more than two years. Bigelow also said the monies will support a community event coming up in July. “That’s when we have planned a free swim at Petrack Park that that we are sponsoring as well as the ‘check your seat in the heat’ program where we remind adults about leaving kids in the car during the hot summer months,” he said. Bigelow said crews hope they can surpass the dollar amount posted during last year’s drive at $11,226.